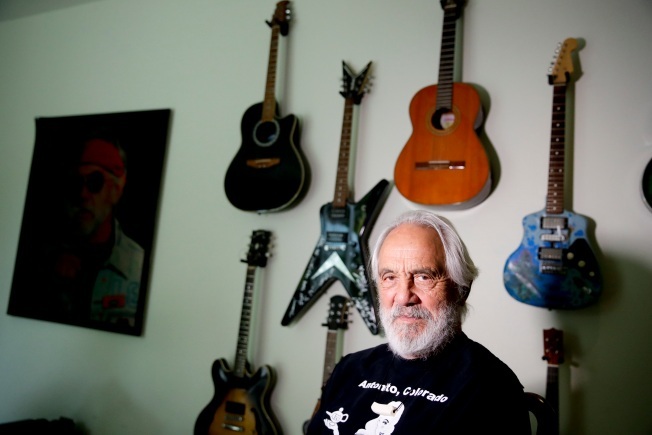 Tommy Chong poses for a picture at his home, May 15, 2018, in Los Angeles. About to turn 80, Chong says he never doubted he'd live to see the day when marijuana would be legal in one form or another in 30 states across the country. Now, with his own Chong's Choice line of artisanal pot, Chong prepares to celebrate his 80th birthday this week with a gentle I-Told-You-So. He had no doubt when he and partner Cheech Marin pioneered stoner comedy 50 years ago, a time when taunting the establishment with constant reminders that they didn't just play hippie potheads in the movies — they really were those guys — could have landed them in prison. Not even in 2003 when Chong was imprisoned for nine months for conspiring to distribute handcrafted artisanal bongs the government declared drug paraphernalia. "Oh yeah, I saw it coming," he says of cannabis being legal in some form in about two-thirds of his adopted country's 50 states. "In fact, I kind of planned the whole thing out," he jokes. "Well, maybe I was a little premature with that bong thing. But other than that, I was pretty much right on point." So much so that when the High Priest of Stoner Comedy turns 80 on Thursday — that's right, 80 — he expects his Chong's Choice brand of marijuana, available in legal dispensaries in several states, will be consumed in abundance at the parties his family is planning. "Tommy likes to say he tests every single batch. Which obviously he does. And he really enjoys it," his son Paris Chong says with a laugh. "For this one, make sure that whatever you have to eat around the house is healthy because you'll find yourself munching away like crazy," the elder Chong says as he holds up a jar packed with a dozen or so choice green buds. "Oh, and we have chocolates too," he says, reaching for a package of candies that vaguely resemble Tootsie Rolls. Not that he was ever a heavy pot user, Chong says, just a consistent connoisseur. "When I was 17, a jazz musician gave me a Lenny Bruce record and a joint at the same time, and it changed my life," he recalls. "I quit school I think a week later and went on the road and became a blues musician and eventually a comedian, and the rest, as they say, is history." His group Bobby Taylor and the Vancouvers was signed to Motown, and Chong co-wrote the band's only hit, "Does Your Mama Know About Me," a smooth R&B tune that rose to No. 29 on the Billboard Hot 100 in 1968. When no other hits followed, Motown dropped the group, and the Canadian-born Chong returned to Vancouver, British Columbia, where he ran a pair of strip clubs with his brother. There he crossed paths with Richard Marin, a Mexican-American art student from Los Angeles eight years his junior, who asked to join the house band. The pair began warming up audiences with stoner jokes, and a comedy team was born. After some discussion of what to call themselves — Chong says "Richard and Tommy" and "Chong and Marin" were quickly rejected — they settled on Cheech (Marin's nickname) and Chong. By then, Motown had helped Chong obtain a green card, and the two headed to fame and fortune in Los Angeles. On a recent early morning, Chong answers the door for a photo shoot at his longtime home in the hills overlooking L.A.'s wealthy Brentwood section, arriving in gray jeans, sandals and a black T-shirt advertising the name of a Colorado cannabis dispensary he recently visited. He offers to change into another shirt for the photos before deciding to stick with the original. "Don't want to ruin my image," he concludes with a smile. As a photographer sets up, Chong polishes off a breakfast of oatmeal topped with sliced banana. In recent years, he's become a vegetarian, although he backslides. "Especially if you put a plate of dim sum in front of me. Of course, that's my cultural heritage." Chong, whose father emigrated from China before World War II, mostly identifies culturally as Chinese, although he's equally proud of his Scotch, Irish and Native American ancestry from his mother's side. Married for more than 40 years to his wife, Shelby, he's a family man with six grown children, three grandchildren and a great-granddaughter. More than just a stoner comedian, he's been a passionate marijuana advocate for decades. He used cannabis during a bout with prostate cancer 10 years ago and more recently during treatment and recovery from colorectal cancer. He finds it ironic that if the U.S. government hadn't outlawed marijuana in the early 20th century, he and Marin might never have had a comedy career. Before the pair's bitter 1980s breakup, Cheech and Chong dominated comedy for 15 years. They released five Grammy-nominated, best-selling albums between 1971 and 1976, winning the 1973 Grammy for "Los Cochinos." Turning to films, they wrote and starred in a half-dozen, beginning with 1978's "Up in Smoke." After the breakup, they would try periodically to reunite. Those efforts generally ended in angry, insult-laden exchanges until 10 years ago when Paris Chong intervened. Finding an email on his father's computer from Marin asking if he wanted to try again to put aside differences, the son didn't bother to tell the father. He simply wrote yes and hit reply. "And then I told my dad, and they were really happy," he recalls, chuckling. "Sometimes you've just got to get out of your own way." "There's a bond now that will always be there no matter what happens," says Chong, who in casual conversation sounds little like his stoner-dude alter-ego. And "yeah," he says, answering the obvious question, "we still toke up."